This tour was fantastic! There were 12 of us and during our two weeks together we all got to be close friends. We saw all the places, from Normandy through Belgium to Germany, and got an excellent look at all the places where history was made. Kevin is very knowledgeable and did a great job shepherding us from village to museum. Because we had a WW II vet on board, we were able to see and experience many moving moments. We highly recommend this tour. 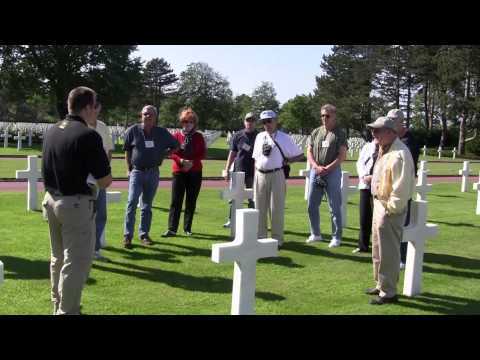 NOTE: In 2019, General Patton expert and tour historian Kevin Hymel will be leading a 75th Anniversary of D-Day & Patton’s 3rd Army Tour in June instead of our regular In Patton’s Footsteps Tour, which will run again in 2020. The anniversary tour will be a modified version of the In Patton’s Footsteps Tour, but it will start in London and include all the Normandy anniversary activities. If you would like to sign up for the 75th Anniversary of D-Day & Patton’s 3rd Army Tour with Kevin click here. Also, mention Kevin’s tour in the notes section of the booking form. General George S. Patton believed in fulfilling the unforgivable minute with sixty seconds worth of distance run. He proved it in his race across France, his relief of the besieged town of Bastogne and his drive into Germany. On the In Patton’s Footsteps Tour, a fascinating WWII Tour, we visit the sites and battlefields significant to Patton’s Third Army, including Normandy, Brittany, Mont-St-Michel, the battlegrounds of Falaise Pocket, the German border, and the Battle of the Bulge, to understand how this maverick general helped win the war in Europe. Our historian for this tour is Kevin M. Hymel, author Patton’s Photographs: War as He Saw It. He is the historian for the United States Air Force Chaplain Corps. Previoulsy, he was the Research Director for WWII History, WWII History Quarterly, and Military Heritage magazines; he has written numerous articles for each. He served as a historian at the U.S. Army Combat Studies Institute at Ft. Leavenworth, Kansas. Mr. Hymel has been a popular historian with Stephen Ambrose Historical Tours for more than 10 years, and has appeared in numerous documentaries on the History Channel and American Heroes Channel. He received his Bachelor’s Degree from LaSalle University and Master’s Degree from Villanova University, both in History. Guests fly independently, normally on an overnight flight from the U.S. to Paris. Please be sure to book your flights so that you will arrive in Paris as early as possible on the morning of the first full day of the tour. 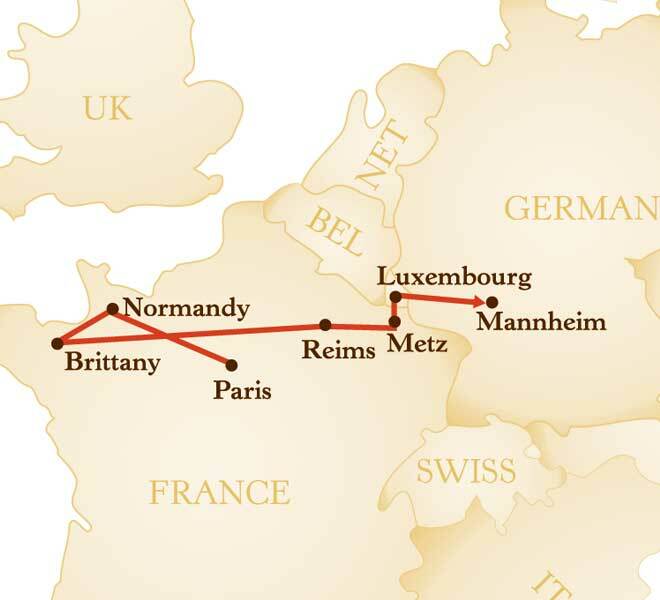 We depart in the morning from the Paris hotel and proceed to Normandy. We will visit Pegasus Bridge where the first action of D-Day occurred shortly after midnight on June 6. At the Normandy hotel, we will convene for a welcome reception and dinner. Today, we will visit Utah Beach and its Museum of the Landings. We then go to Pointe-du-Hoc to view the cliffs the Rangers scaled. In the afternoon we visit Omaha Beach, where the 1st and 29th Divisions came ashore in some of the bloodiest action of the day. We have a solemn finish at the American Cemetery, where we pay our respects to our fallen heroes. Our day will begin at Patton’s Headquarters in Nehou where the general waited for the Third Army to become operational. From there we will drive to Coutances then Avranches, where Patton first took command. We will stop at a statue to Patton where the Third Army broke into the Brittany Peninsula and headed east, west and south through the German lines. Finally, we will see the Pontaubault Bridge where Patton’s troops poured into the Brittany peninsula. We will visit Mont St. Michel, the medieval monastery where Patton and his wife honeymooned. It is a must for any visit to France. We continue to Mortain, the mountaintop town where the Germans attacked the 30th Infantry Division in an effort to cut off Patton’s base of supplies. Although surrounded, the Americans held out for seven days until relief arrived. The mountaintop affords an excellent view of the surrounding countryside. In the morning we will visit Mayenne, where one of Patton’s hard luck divisions turned itself around by seizing a vital bridge. Then we will travel to Argentan where elements of the Third Army turned north to close the Falaise Gap. At Chambois, we will study the area where American, Polish and Canadian troops fought to stop the retreating Germans. The museum in Chambois provides an excellent overview of the battle at the Falaise Pocket. We begin our day at Eisenhower’s headquarters in Reims. Here German General Alfred Jodl signed the unconditional surrender on May 7, 1945 ending WWII in Europe. We will then go to Verdun, site of some of the greatest battles of World War I, where, in 1944 Patton, Eisenhower and Omar Bradley met to formulate a plan to break the German stranglehold on Bastogne. It was here that Patton claimed he could begin fighting toward Bastogne in 48 hours and relieve the 101st Airborne Division and other Army units that were locked in a life-or-death struggle in the Belgian forests. We will then visit Essen and Pannes, two of the towns where Patton led his tanks into the battle of St. Mihiel, one of the first major engagements by the U.S. Army in the First World War. Near Essen, we will see the location where Patton, a 32-year-old Lieutenant Colonel, met Brigadier General Douglas MacArthur during an effort by the Allies to cut off a German salient in their lines. The two bravely stood together as German artillery passed over them. In Pannes, Patton rode a tank into battle and personally helped chase the Germans out of the town. These actions in World War I foreshadowed the future capabilities of tanks— and Patton— in warfare. In September 1944, with little fuel, supplies and replacements, Patton found himself stalled outside Metz, a city surrounded by six steep granite hills that had been heavily fortified by many occupiers over the centuries. No army had ever overcome its stalwart defenses. From there we will see where Patton’s forces crossed the Moselle River and fought off a German counterattack. After study and discussion in the field, we will tour Fort Hackenburg. This integral part of the Maginot Line, France’s defensive front in 1940 and Patton’s troops fought over the position later in 1944. We later will get an opportunity to view the dragon’s teeth of the German Siegfried Line. When the Germans launched the Battle of the Bulge, Patton turned his Army north towards Bastogne. We will view the Patton statue in Ettelbruck and tour the Battle of the Bulge Museum in Diekirch. We will eat lunch in Clervaux, where the Germans broke through the 28th Infantry Division. From there we will travel to Longvilly and Noville, where armor and airborne forces slowed, then stopped, the German drive to Bastogne. We will complete the day with a visit to Patton’s headquarters during the Battle of the Bulge. From Luxembourg City, we will retrace Patton’s relief of Bastogne. We will see the site of the final attack by Colonel Creighton Abrams to relieve the 101st Airborne Division. After a stop at McAuliffe Square where you will learn the history of the Sherman tank on display, we will drive to Houffalize, where Patton’s Third Army helped close the Bulge. The day will end with a visit to Patton’s grave at the American Cemetary in Hamm. We will drive to Trier, Germany, which Patton seized despite orders to the contrary. When Bradley told Patton he did not have enough forces to take the city, Patton radioed back, “What do you want me to do, give it back?” We will visit a Roman coliseum and the Porta Nigra, the black gate that the Romans erected in 180 AD. After that we will drive to Mannheim and see the spot where a car accident paralyzed Patton and eventually cost him his life. We can review and reflect on our journey across Europe, and our travels in the footsteps of General Patton, at the Farewell Dinner on this last evening of the tour. Transfer to Frankfurt airport. Please book flights that depart after 10 a.m.
Prices are per person based on double occupancy. For a single room add $900.